Do you have trouble getting your children to clean up their rooms, put their dirty clothes in their hamper or laundry basket or just are tired of boring old hampers taking up space in bedrooms? 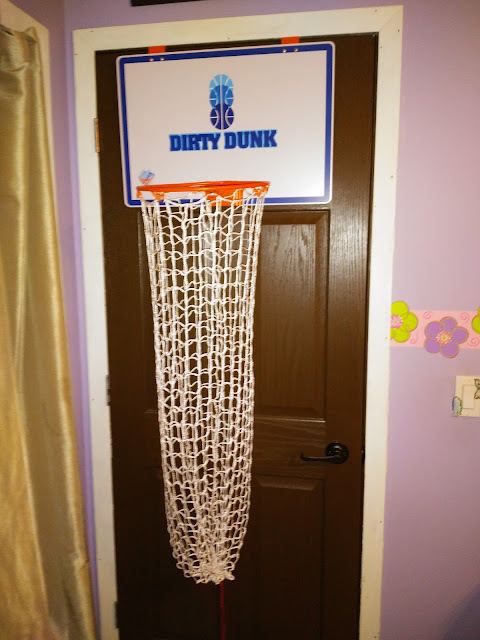 Then you have seriously got to check out the Dirty Dunk, the original over-the-door basketball hoop laundry hamper - a product that not only makes children WANT to pick up their laundry, but looks good too! It is my children's new favorite accessory in their room and I am happy because their room has been SO much cleaner and they don't mind when I say "Time to clean up your room!". 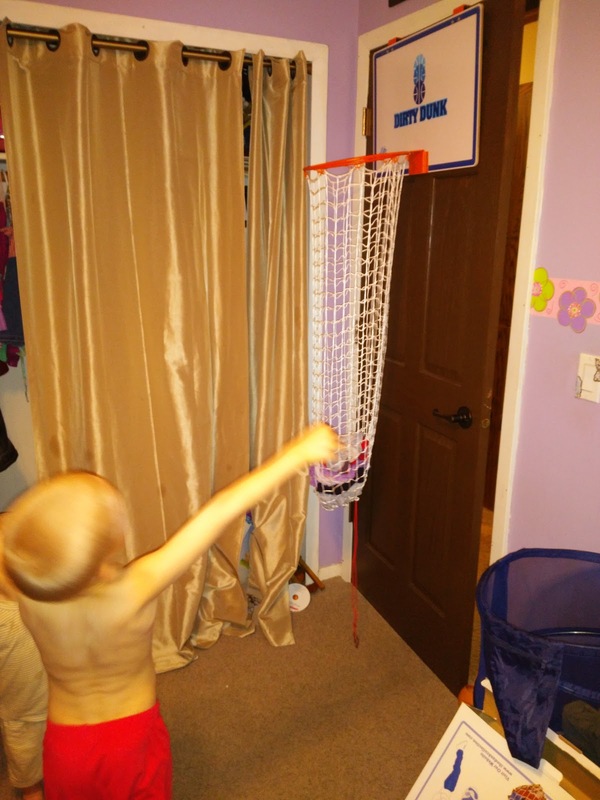 The Dirty Dunk™ gives kids a cool and fun way to keep their rooms clean and allows parents to breathe easier at night. And my favorite part - I could set this up myself - there was almost NO assembly and I didn't have to get out any tools, waste precious minutes of my day or get frustrated setting it up! 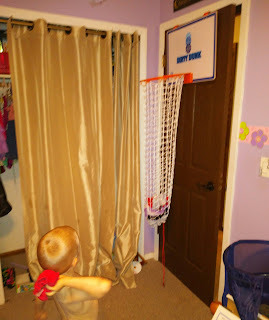 I just took it out of the box, hooked the backboard on the door and hooked in the rim and net on the backboard! AND DONE! The clothes were ready to get DUNKED and SWISHED! 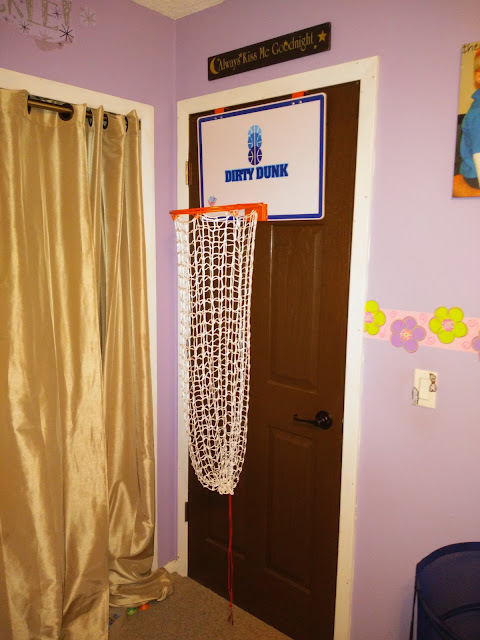 Dirty Dunk™ hangs securely from your bedroom door with sturdy padded metal hooks and is made with a sturdy backboard 23’’x15.75’’ (best quality on the market). • 45“ long nylon net with a handy drawstring bottom. Keep your desk clean and clutter free with the Document Dunk™, a miniature basketball goal designed for an executive's wastepaper basket. Just aim, shoot and swish. The Document Dunk is the perfect addition to transform your office/cubicle into a corner office. This is really a fun gift idea for any basketball lover! You can purchase all The Dunk Collection products exclusively on their website and on Amazon. The Dunk Collection is generously offering (1) Dirty Dunk & (1) Document Dunk to TWO lucky winners!